On Friday, September 7 and Saturday, September 8, 2018, the National Institutes of Health and the John F. Kennedy Center for the Performing Arts, in association with the National Endowments for the Arts, hosted Music and the Mind, Shaping Our Children’s Lives Through Music Engagement. For this second Sound Health event, acclaimed musical artists joined top neuroscientists to explore links between music, rhythm, and brain development. 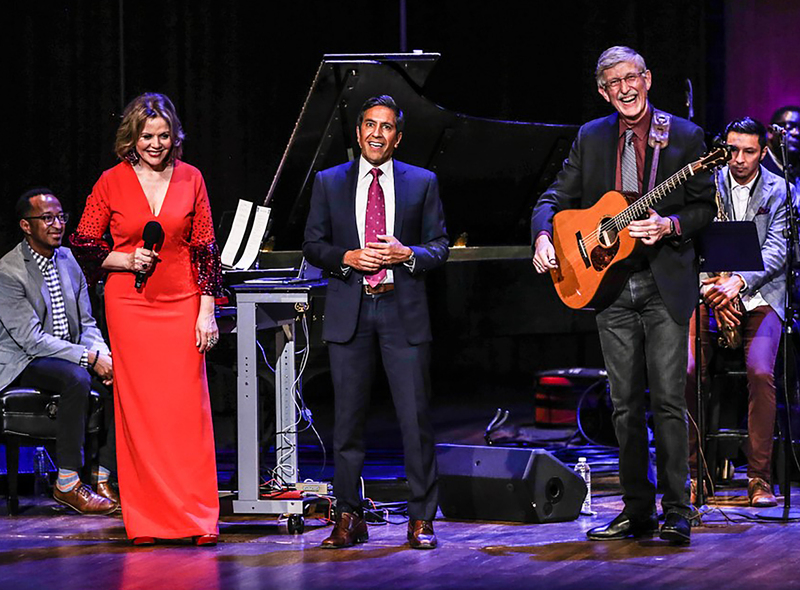 Presenters and performers included NIH Director Dr. Francis Collins, soprano and Kennedy Center Artistic Advisor at Large Renée Fleming, CNN’s chief medical correspondent Dr. Sanjay Gupta, Grateful Dead percussionist Mickey Hart, tabla master Zakir Hussain, pianist and Kennedy Center Artistic Director of Jazz Jason Moran, along with other special musical guests, and neuroscientists Drs. John Iversen, Nina Kraus, Charles Limb, and Laurel Trainor. The day-long series of activities, workshops, and discussion with artists, educators, and neuroscientists explored how rhythm and music impact our lives from a young age. Say It With Rhythm! A Performance Demo with Dr. Nina Kraus featuring Mickey Hart and Zakir Hassain. Dr. Nina Kraus, Hugh Knowles Professor at Northwestern University, and Dr. Adam Gazzaley, Professor in Neurology, Physiology and Psychiatry at University of California, San Francisco, were joined by Grateful Dead percussionist Mickey Hart and tabla master Zakir Hussain to illustrate the art and science of rhythm. Take Note! Why Music Education Matters: A Panel Discussion Moderated by Renée Fleming. Renée Fleming led a panel discussion with Dr. Francis Collins, NIH Director; Dr. Rollo Dilworth, Chair of Music Education and Therapy at Temple University; Dr. Kenneth Elpus, Associate Professor of Music Education at the University of Maryland; Dr. John Iversen, Associate Research Scientist at University of California San Diego; Dantes Rameau, Co-Founder and Executive Director of the Atlanta Music Project; Melissa Salguero 2018 Grammy Music Educator Award Recipient; Laurie Schell, inaugural director of Music Makes Us with Metro Nashville Public Schools; and others, as well as a special performance by the Washington Performing Arts' Children of the Gospel Choir. Learning and Bonding to the Beat: Optimizing Your Child’s Development with Dr. Laurel Trainor. In this discussion-demonstration, Dr. Laurel Trainor, director of the McMaster Institute for Music and the Mind at McMaster University, detailed how music and rhythms affect learning, and reveals the importance of rhythmic movements for optimal social development. She's joined by Dr. Joanne Loewy, director of the Music Therapy Department at Mount Sinai Beth Israel, and others, who use music and movement with infants and children who are at risk for developmental disorders. The session featured a special performance by musicians of the D.C. Youth Orchestra. Sound Health: Music and the Mind with Mickey Hart - Millennium Stage. Dr. John Iverson, Mickey Hart, and Zakir Hussain guided the audience through call-and-response games, lively performances, and an interactive demonstration. The Art of the Spark: Musical Creativity Explored with Dr. Charles Limb. Dr. Charles Limb, Francis A. Sooy Professor of Otolaryngology at the University of California, San Francisco, with pianists Jason Moran and Matthew Whitaker, demonstrated how encouraging and developing musical improvisational skills in children has led to a better understanding for how creativity is implemented in the human brain.